Who would miss you if you were gone? If you didn’t show up to work, didn’t send out that newsletter, didn’t make that sales call, didn’t tweet that tweet… who would miss it? How does your answer shape how you’ll live out 2015? My first response to this prompt was entirely personal: the only people who will miss me when I am gone are the people who have truly seen me, in my full, messy, completeness. Other people may miss the place I fill in their life, but it won’t be ME they miss. Upon further reflection, this also applies to my work. The people who will miss me will be the people I have seen in their wonderful imperfection and walked beside and the people who have heard or read the words that could have only come from me and been moved by them. And this very simply turns into a call to let that which is unique about me into the world and to connect with people in their heart of their humanity. *SETH GODIN is the author of 18 books that have been bestsellers around the world and have been translated into more than 35 languages. He writes about the post-industrial revolution, the way ideas spread, marketing, quitting, leadership and most of all, changing everything. You might be familiar with his books Linchpin, Tribes, The Dip, Purple Cow, and The Icarus Deception. His latest, What To Do When It’s Your Turn, is an urgent call to do the work we’re hiding from, a manifesto about living with things that might not work, and embracing tension when doing your art. 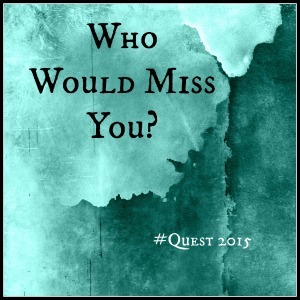 This entry was posted in Daily Life and tagged #quest2015, Seth Godin, show up fully. I would miss you Kate!